Are you frustrated because you can’t seem to stop eating? I’d like you to take a more detailed look at these times when you can’t stop eating. Because the way I think about it, you may be making progress that you just can’t see yet. 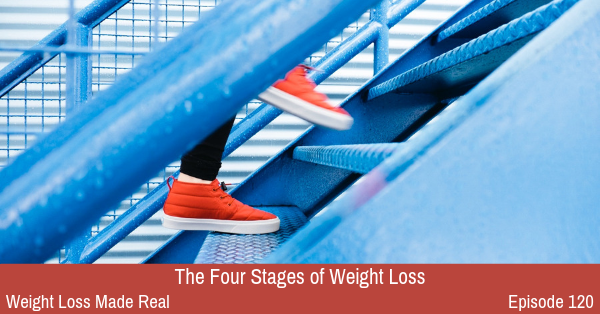 There are four stages of losing weight. And you need to get through all four of them to be able to eat the way you’d like to eat. And, if you know about the four stages, you’ll be able to see where you are, understand why you’re there, and keep moving forward. So, what are these stages? Stage 1 is when you’ve just overeaten, and you realize what has happened when it’s all over. Stage 2 is when you’re in the middle of overeating, you see what you are doing, and yet you just can’t get yourself to stop. Stage 3 is when you are able to see what you’re about to do. You haven’t started overeating yet. You are able to step back and see what is happening. And still, you can’t stop the habit. You eat anyway. And finally, Stage 4 is when you’re about to overeat, you see what is happening, and yes! You are able to stop yourself! This is big! So, what we’re going to talk about today are these four stages. I will tell you why you’re in each one. You’ll learn what you’re likely to do and think at each stage. And, I will help you get a good perspective of where you are, and what’s ahead, so you don’t give up. Join me as I coach you and teach you a new way to look at your attempts to stop eating without hunger and lose your extra weight. 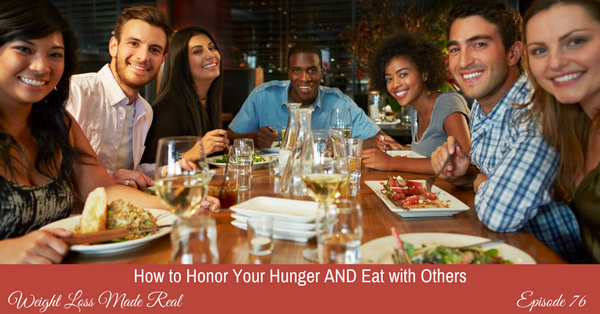 Do you have trouble with the feeling of fullness and stopping eating when you’ve had enough? Welcome to a very large club! Most of my clients find it MUCH easier to know when they are hungry than they do knowing when they are lightly satisfied. Why is it so hard to figure out when enough is enough? Partly, it’s such a subjective thing. There is no beeper or alarm or light that goes off like the one in your car. Wouldn’t it be nice if some personal signal let you know exactly when you were full? One of the challenges is that if you have extra weight on your body, you are most likely to be used to feeling full a lot of the time. If you get used to that feeling, then that becomes the normal time to stop eating. 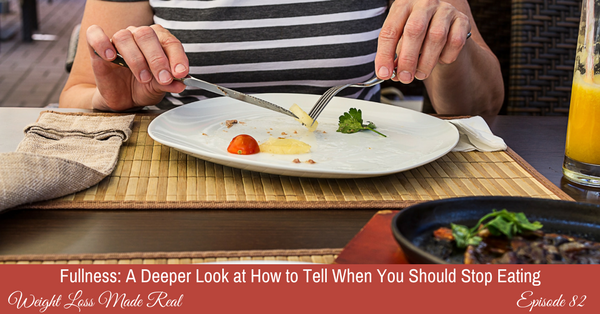 Join me as I give you a system for knowing how to tell when you’ve had enough, no matter now good it is, and stop eating. THE FREEDOM COACHING GROUP: If you’ve ever dreamed about having your own personal coach to work on your eating with you, you’re closer than you think. My coaching group is happening now! It’s super affordable, supportive, and an amazing resource if you struggle with overeating, emotional eating or binge eating. Take all you’re learning here on the podcast and go to the next level. Click here: http://weightlossmadereal.com/group to get all the details and join our group Weight Loss Made Real: The Freedom Group. Because really, isn’t freedom what we all want? I hope to see you in the group! Comments Off on Episode 75: Why You MUST Have Clear Guidelines to Lose Weight! Snickers before lunch? Cupcakes before dinner? Fast food after breakfast? What do you eat and when do you eat it? If you’re a regular listener, you know that the first thing you need to do is check in with yourself and make sure you’re hungry. And then if you are, what do you eat? In this short and sweet coaching session, I teach you the difference between a snack and a treat. We talk about when you might want to have either one. And how to make smart choices when the time comes. It’s time to stop kidding yourself about your food choices. It’s time to know when to eat what. And be able to shed your extra weight and stick to your plan. 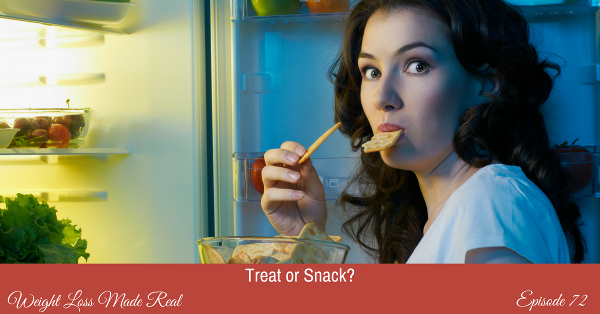 Let’s dive into the snack vs. treat debate. Comments Off on Episode 72: Treat or Snack? We all overeat sometimes, especially on our way toward learning how to eat naturally. The important thing to look at when you DO overeat is what you do immediately after. Do you punish yourself? Do you restrict your eating to ‘make up’ for what you just overate? You may very well be sabotaging yourself without realizing it! 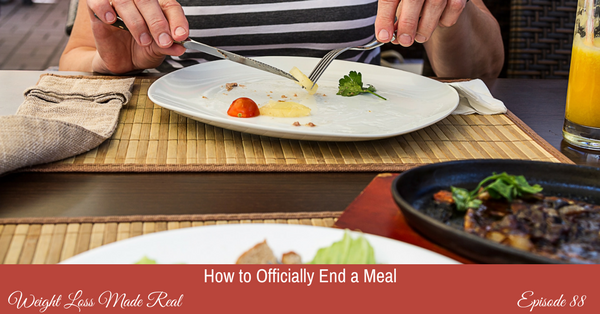 Restricting your eating following an overeating episode messes with your survival instincts. It reinforces a habit that is exactly what you want to stop doing! Listen in and join me in this coaching session as I teach you why it’s so important not to restrict your eating after you’ve overeaten. 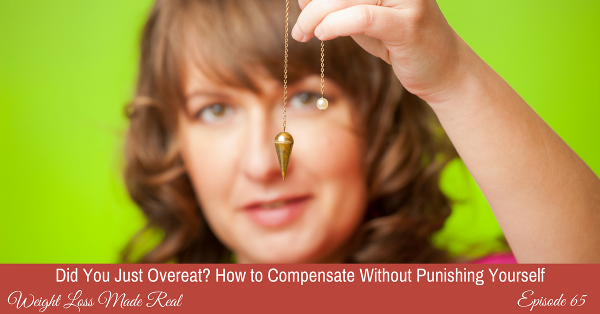 If you regularly swing between overeating and then under-eating, this session is for you! Hi there! Do you ever eat in a restaurant? Of course, you do! These days we all eat out more than ever before. And one of the most fearful eating experiences when eating out is dealing with a buffet. You know, those restaurants where there are long, long tables of food and all of it looks and smells delicious. 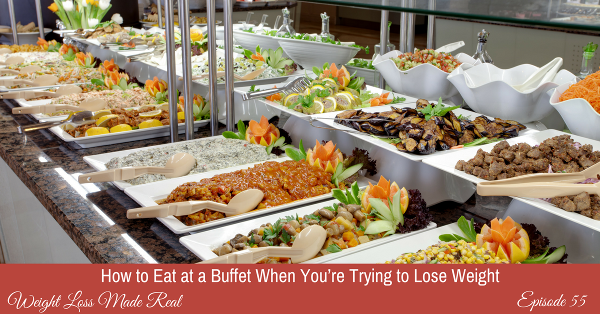 You know that in the past, the buffet signaled the end of your self-control and the beginning of regret and shame. But there’s a new way to look at an eating event like a buffet. Or any restaurant meal. Or dinner at a friend’s house where you have no choice about what is served. In this coaching session, we are going to talk about a new way to not only eat at a buffet, but a new way to think about buffets. With this new mindset, you will be in charge of yourself and your eating no matter what’s in front of you. So get cozy and grab a notebook, and get ready to be coached. There are so many components to eating well for health and weight loss AND freedom! Knowing when you’re hungry. Knowing what to eat. Knowing when to stop. And managing your emotions. In this coaching session, we will talk about how to make those ‘what do I eat?’ decisions in a way that will lead you toward peaceful eating. We’ll take a look at how you eat right now, and what influences your food choices. And why it pays to think about what you’ll be eating ahead of time. Want to be spontaneous and just wing it? Then you should know what your results are likely to be. 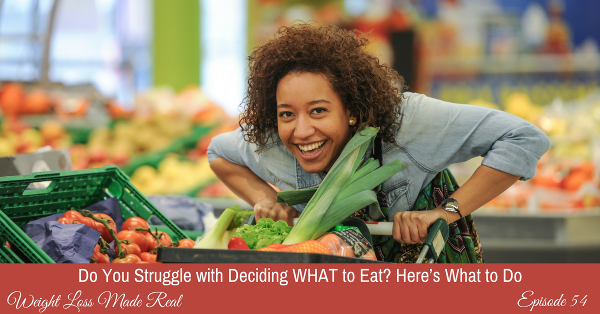 And, I’m pulling back the curtain to reveal my own food struggles that kept me stuck in a vicious cycle, and how I got out of it. Let me coach you on how to find the foods that are truly right for you. Join me!